Welcome the second of our posts as we count down to the end of the year 2014 #Before2015. Our previous post dealt with the issue of forgiveness and how important it is to not take those issues into the coming year. As we move on today, we will deal with #Excuses, and how these should not be taken with us into 2015. The most significant expectation in one’s life is the expectation that one has for oneself. It does not matter how highly the world thinks of you if you do not think highly of yourself. In the same way, no matter how low people think of you, it does not matter and will in no way affect you as long as you know who you are. The only opinion that is greater than your own is God’s. I want to challenge you today, stop making/accepting excuses from yourself. Stop making reasons why you cannot achieve or reach such and such a goal. People have reasons why they cannot win, why they cannot lose weight, why they cannot pray more, why they cannot start their business and why perhaps even why their marriage is falling apart. Making and accepting excuses from yourself is similar to giving your enemy a list of your weaknesses in a war. Once you make an excuses, you accept where you are. You no longer have that motivation to strive and go beyond that. No more excuses! 2015 will not hear another excuse from you. 1 Samuel 17 tells us of a small insignificant shepherd who took on a giant. If anyone had excuses, David had excuses! 2: I am not trained in combat, if the army cannot do it how can I? 3: The armour itself is to big for me, how do I defend myself? 4: Everyone has already told me how idiotic it is for me to even think of it, let alone try to go again this giant. 5: What if I fail? These are just some of the excuses he could have made. He was only a boy! 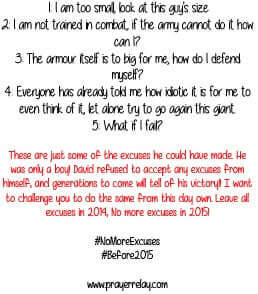 David refused to accept any excuses from himself, and generations to come will tell of his victory!! I want to challenge you to do the same from this day own. Leave all excuses in 2014, No more excuses in 2015! This is what David reminded himself of. He reminded himself of the one he served! You will topple giants in the name of Jesus. As you move away from excuses you’ll flourish in all you do. Your work will no longer be limited by what others think or say. You are entering another dimension in business. Do not be afraid to go for it this year. Do not sit on those ideas any longer, step out and fight! Father I repent of any and all times that I have made excuses. I refuse to lack trust in you. 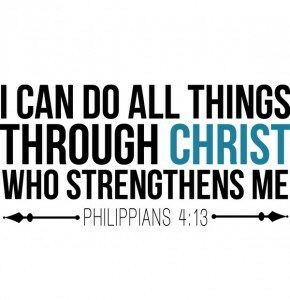 Lord I thank you for your enabling grace, I can do all things through Christ who strengthens me. In the name of Jesus, 2015 will hear no excuses from me. 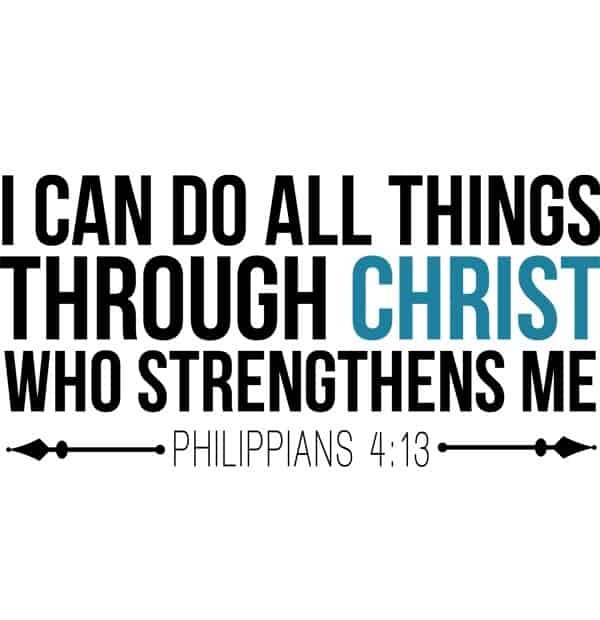 I will gallantly face all giants that come against in Jesus’ name. I give you praise Lord, all glory and honour is your. I pray this in the mighty name of Jesus. Amen.